Plaque describing the Battle of Franklin. The lower right corner is where the quote below was pulled from. 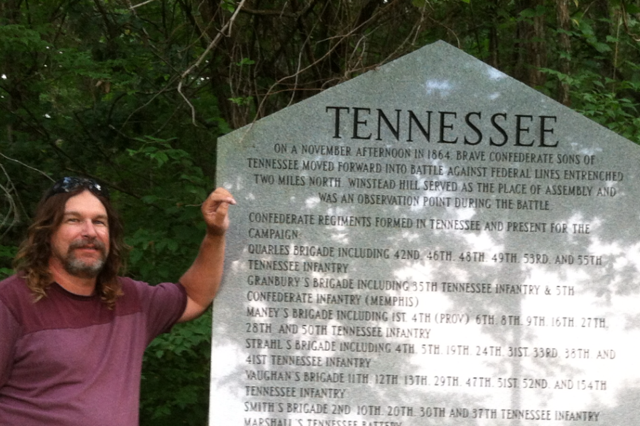 Stopped by the small Civil War park in Franklin TN yesterday having no idea such a large battle had been fought there. On November 30, 1864 the Southern General John Hood held a position on the hill where the park is now located. He decided to attack the Northern troops located toward Franklin. His line was the largest single array of troops in the entire war, some 19,000 men moving shoulder-to-shoulder across the fields at the foot of the hill. Maybe the musicians should have altered the playlist with a tune less controversial than “Dixie.” The Union troops listened for a bit then opened fire. When the smoke cleared at day’s end there were over 6,000 Southern casualties. The action was a disaster for the South. In just the first few minutes of battle, five Southern generals lost their lives in the field just to the right of the hill. Altogether 15 Southern Generals were killed in the fierce fight. Hood’s forces were rendered incapable of effectively engaging in battle for the remainder of the war. Imagine walking from Gettysburg to Atlanta and on to Nashville as these troops must have done, including the musicians. Tough gig, tougher crowd– b.e. One of many markers on the site detailing the battle. Man, I greatly enjoy history but let’s inject wisdom in all situations and pour out understanding, tolerance and love instead of hate so we never get to this point again as some are now calling for. Our nation torn in two, boys not yet in their prime being slaughtered and killing each other by the truckload? It can’t be near as much fun as it sounds. Franklin, TN is the most adorable town ever. I want to live here.